For this unit about trees, please begin with the first in the series, Trees and Seasons Introduction (below). Start this lesson early in the school year before summer officially ends, or during the summer if you are fortunate enough to teach all year, so that students have a chance to see the classroom tree that they adopt in each season of the year. It is also a great idea to get students out of the classroom and into the living environment. Gather the "Tree" journals that the students created in the last lesson plan (Trees and Seasons Introduction). Teach: Read A Tree for All Seasons. Show the students the poster you have made of a tree in the four seasons (can be copied and enlarged from mine below or store bought). Explain that the seasons are a "cycle," meaning they go around and around throughout each year. 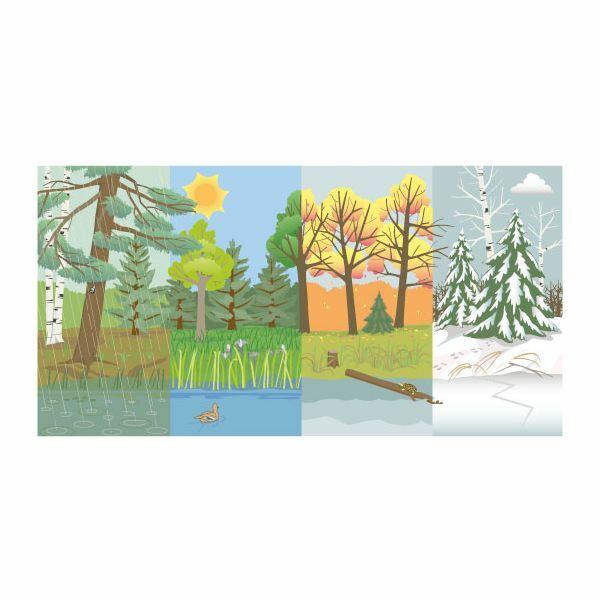 There are four seasons during the year, summer, fall, spring and winter. Trees, weather and the clothing we wear changes with every season. Currently we are in the season of summer. In summer the weather is very warm or hot, the tree is in full bloom with rich green leaves and we dress in lighter clothes so that we do not get too hot. Trees give us shade in the summer. Pass out journals and pencils. Have students copy the word "Summer" as a title on the top of the first page of the journal. Draw a title line on the page for younger students and assist with printing as necessary. Take the class outside. Have them sit on the ground near the adopted, summer tree with their journals and a pencil. Discuss what the summer tree looks like. Students draw the tree in the journal. Discuss the color of the leaves and what they sound like. If possible pass a few leaves around or bring a few into the classroom for closer examination with magnifying glasses. If desired, have students draw a picture of a summer leaf in their journals. Discuss the weather. What is the weather today? Students draw a sun and sky on their summer journal page. Use an outdoor thermometer to take the temperature. Discuss clothing. What kind of clothing are we wearing today? Students draw a picture of themselves under the tree. Once inside students color their picture, and if possible label the picture. Younger students can use letters to label, older students can use words. Have the students record the temperature on their journal page, and provide paper thermometers for the students to color in the mercury level on the thermometer to the correct degree. For younger students, this can be done as a whole group. Assess: Journals- does the picture depict the season that we are in? Is it neat and labeled with the title?